Born: April 18th, 1960 in Kingston, Jamaica. Hopeton Brown better known as Scientist and sometimes known as Overton Brown, from Kingston, Jamaica was a protégé of King Tubby (Osbourne Ruddock), one of the originators of dub music. The Scientist burst onto the reggae scene in the mid ’70s with a reckless mixing style that seemed to outdo even King Tubby’s wildest extravaganzas. He began his career as an engineer at Studio One and soon after at Tubby’s in the late 70’s. Shortly afterwards, he gained a reputation with a distinctive mixing style. 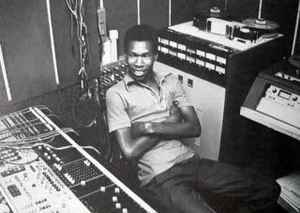 He left King Tubby's studio in 1982 and became the principal engineer for Channel One Studio, giving him the chance to work on a 16-track mixing desk rather than the four tracks at Tubby's. He came to prominence in the early 1980s and produced many albums, his mixes featuring on many releases in the first part of the decade. In particular, he was the favourite engineer of Henry "Junjo" Lawes, for whom he mixed several albums featuring the Roots Radics, many based on tracks by Barrington Levy. He also did a lot of work for Linval Thompson and Jah Thomas. In 1983 he left Channel One to work at Tuff Gong studio. He made a series of albums in the early to mid 1980s, released on Greensleeves Records with titles themed around Scientist's fictional achievements in fighting Space Invaders, Pac-Men, and Vampires, and winning the World Cup. The music on these albums was played by Roots Radics, his most frequent collaborators. Five of his songs from the album The Scientist Rids the World of the Evil Curse of the Vampires were used as the playlist songs on the K-Jah radio station in the 2001 video game Grand Theft Auto 3. “In the ’70s, I started building sound system audio amplifiers. I would then test the amplifier with test instruments to determine how the amplifier was performing. Everything would look normal, but when I played reggae music through the amplifier, it would over heat and the plates of the KT88 would run red, especially when I played a mix from the great King Tubby’s that had subsonic drum and bass frequencies as well as razor sharp high frequencies I would have to re -bias the KT88 and make other changes in order to accommodate reggae’s wide frequency response and high slew rate needs. I noticed when I played other types of music the amplifier would respond normal. I found that to be strange so I used King Tubby’s mixes as a platform to ensure that the amplifiers would not break down under extreme conditions. Does anyone know what the deal is with the releases on merchbar.com? They have the Junjo releases available on there as well so it could just be the reissue from Russia. Merchbar is linked to the scientists spotify page, not like that makes it official but it definitely sparked my interest. Does anyone have Sometime Lover, 12", on Black Ovation label? Triston Palmer Inna Roots Radics Drum and Bass. The only man to surpass the genius mixing of King Tubby. Prince Jammy can't compare! absolute genius. arguably one of the best artists to ever come out of jamaica. I can't believe no one's reviewed this fella before me??? Born 18th April 1960, Scientist is true a legend, he took Dub Reggae to a completely different level. Trained and mentored by the late, great, lamented King Tubby, he blew the scene into smithereens with his knowledge, skill and complete understanding of the mixing desk. You all know as well as I do that he quite comfortably sits along side the higher echelons of Jamaican genius, Lee Perry, King Tubby, Augustus Pablo, Prince Jammy, The Roots Radics, The Revolutionaries,The Upsetters, Bunny Lee, Joe Gibbs, to name but a few. The amount of sheer genius, raw talent that has come out of this tiny, little, Caribbean Island called Jamaica is unfathomable...... I am always in awe, Long may it reign.